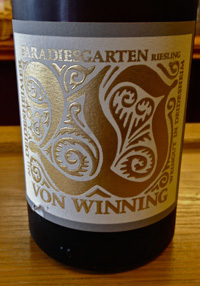 2011 Weingut Von Winning, Riesling “Paradeisgarten” Deidesheim Paradeisgarten, Trocken, Pfalz, Germany. The Deidesheimer Paradeisgarten from Von Winning is a stunner, the open and riveting 2011 is drinking much better even than it did the last time I tried it, and in fact I recently got a chance to sample it from three separate bottles, each slightly different, but all thrilling experiences. While the 2012’s look like they have more of everything and bigger potential, these 2011’s are wonderful wines, drinking great now even and this Von Winning 2011 Paradeisgarten is a truly unique and charming Riesling with exotic flavors and excitement on par with Premier Cru white Burgundies, if not better, especially if you love dry Riesling! Terry Theise the importer and Riesling evangelical prophet likens the Von Winning wines to Grand Cru Chablis, I never disagree with the master, and Von Winning’s wine director Herr Stefan Attmann is clearly influenced by the great wines of Burgundy, he uses all native “Sponti” yeast fermenting, he employs extended time on the lees, his wines are unfined and he uses various Oak casks large and small, even French barriques, making his wines completely to his own style. I know there are some purists out there that balk at Riesling in French oak or wood in general, but these wines are just too damn good to scoff at. The upper Grand Crus are simply out of this world, but across the board these wines are fantastic, especially this 2011 Paradeisgarten which shows light wood details, wonderful density and extract, lively acidity and sublime length. The nose is lightly perfumed with tropical fruit and flowers, baking spices, lemon curd and brioche leading to a palate of lime, mango, apricot, apple pie and pineapple with hints of ginger snap, wet river stones, salted toffee, mint and briny chalk essence. There is vigor and intensity, but a refined creamy feel mid palate, finishing dry and crisp with a super long aftertaste that leaves a peach and citrus cobbler note. Drink now through 2019, this is thrilling stuff, and the 2012 will be even better!